ATM Machine In The Old Market? I am posting from my mobile and we are currently sat in Costa Coffee, can anyone please tell us where the nearest cash point is because we cannot see one? In High Town - part of the ploy to encourage people to go there as well!! The new one, out the back of the Butter Market! To be fair - I hadnt thought about that - but if there are NO cash machines on site and it FORCES people to go into High Town, then that can only be a good thing for High Town. I find it all rather odd, a Â£90 million pound shopping centre and no ATM on site... I don't think it forces people to go into high town because you can get cash back I suppose in most supermarkets but you have to buy something first. It might be that they would prefer people to use debit & credit cards as the government don't like people using cash as it doesn't leave a paper trail as that way they can make sure they get all the tax in? That's a load of rubbish! Where on Earth did you get that idea from? You are entitle to your opinion as am I but I don't believe its rubbish as most things are payed by people using either a debit card or credit card you can use your phone to pay for things now & also over the internet! Another example is scrape merchants they are no longer allowed to pay using cash unless they give you a cheque first & then cash it for you! You may say that's because of metal theft but that's only part of the reason. I believe cash will eventually be phased out how long that will be I don't know 10yrs 20yrs or longer??? Cash will disappear soon and the government will create electronic credit through a card which holds personal information about you. The ulterior motive is towards using the card as a form of ID, although your mobile phone is already doing that. Big Brother really is watching, all the time. What about this "bit coin" thingy, folks were banging on about a while back?? It's a step too far for me! I cannot believe that there are no cash points in the new shopping centre, how strange or was this an oversight I wonder. No now you are moving the goal posts slightly. Paying with cash in the new shopping centre, please explain to me me how on Earth this does not leave a paper trail? When you withdraw cash there is a trail at the bank and when you purchase goods in these stores you are given a receipt. I rest my case. 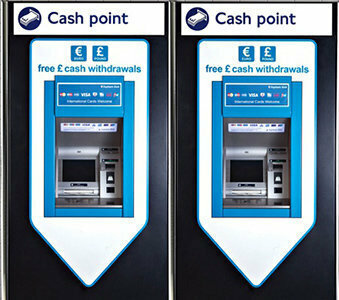 I notice that the Odeon in Worcester has 2 ATMs in its foyer. Maybe they will put one in its cinema here. ODEON Worcester is situated in the city centre. The cinema has 7 screens (Premier Seats, Costa) 2 ATMs which are located in the main foyer. Five images of the Odeon in Commercial Street in 1937. No ATMs! I parked my car this morning and attempted to pay with my debit card, stupid machines only take cash but there are no ATM's! What the hell? I think your find I said the government don't like people using cash as it doesn't leave a paper trail & that would go for big business & banks to? obviously they accept cash as it's legal tender! But big businesses like debenhams,waitrose & banks would prefer everyone one to use debit or credit cards is because it's less work involved for them as debenhams etc do not have to count up the thousands of pounds of cash they get through the tills then put it in a security box before being transported in a secruity van to the bank to then be counted up again before finally being banked! Also businesses get charged more to bank cash! As for not leaving a paper trail if cash is used @ the OLM that might happen if it is not rung through the tills & declared properly for wot ever reason then it won't leave a visible paper trail! As your probably not likely to know if that happens or not it could go unnoticed? So far as receipts go unless you run your own business?or are involved in criminal activities such as drug trafficking, money laundering fraud etc? then the authorities are unlikely to look through your finances?! Megilleland those old photos of the odeon when it first open,it looked a fine buildingâ€¦don't look like that today wot happened? Your not confusing this Odeon which was demolished in Commercial Street with the one in Commercial Road. It was in Commercial Street where Carphone Warehouse and Body Shop is. The Odeon was one of the original cinemas in the Oscar Deutsch chain of Odeon Theatres Ltd. It opened on 17th April 1937 with Will Hay in "Good Morning Boys". The stone facade was in a Classical style to blend in with the townâ€™s historic buildings. Inside the auditorium, seating was provided for 788 in the stalls and 345 in the circle. There were decorative arched features on the splay walls each side of the proscenium, and above the proscenium in the ceiling were five long â€˜tonguesâ€™ which stretched out over the front stalls seating area, that contained concealed lighting. The Odeon had a cafe for the convenience of its patrons. The Odeon was taken over by the independent Brent Walker Organisation on 26th October 1975, and was re-named Focus Cinema. It was taken over by the Classic Cinemas chain on 3rd June 1983, and re-named Classic. This did not last long, and the Classic was closed on 1st March 1984, with Dan Ackroyd in â€œTrading Placesâ€. It was demolished in 1985, and the site redeveloped with shops. In the days before this was pedestrianized, this was where many of the buses would pull up! In later years, there was a "Merritts" shop there - they were the first in the city to have a slush puppy drinks machine, and did a roaring trade, with all the school kids who congregated to wait for their bus to take them home!! Yea I did as it happen but now I remember that building used to go there as a kid in the days when buses used to drive down through commercial street!! Such a shame it's still not standing today!! I would have thought they would have "Looked into a suitable spot to put one in" BEFORE the development opened??!! But well done for asking the question! Not a lot of good if it is closed during the day? Are they opened all day long? What about over near the lifts close to Waitrose. Dippy said ......I would have thought they would have "Looked into a suitable spot to put one in" BEFORE the development opened??!! I learnt many many years ago " failing to plan is planning to fail "
@OldMarketHere @Kev1nBray Surely this should been done BEFORE OLM opened? I suggest near the lifts by Waitrose, I trust these will be FREE? I was caught short yesterday, I was at the old market and needed some cash, guess what, there is no cash point anywhere on site! I could not believe that. I understand that I can ask for cashback but you have to spend money first in order to get it. I saw a friend of mine and owed him a tenner, had to walk into town before I could get any cash, how stupid is that? A shopping centre with no ATM. We did discuss this a while back! If you search "ATM Old Market" there is a thread started by H Wilson, with about thirty comments! Hope this may be useful. Interesting to note there still isn't one.... I'm sure on the original thread, someone had posted that plans were being put in place to site one here. I have now merged these two topics into one.